This is a picture I have been wanting to take for a long time. It's of my sister, Sharlie, running on a trail at the Lake Hodges Trail 5K. Eight months ago Sharlie was on an operating table receiving new lungs and a new heart. This isn't going to be one of my normal race reports, I didn't suffer, I wasn't concerned about my time or my place, and I wasn't nervous at the start; I was simply grateful. For the first time ever, I was able to run alongside my sister, who after a lifetime of not being able to run without stopping to catch a breath, is now able to run a 5K. Sharlie was born with Cystic Fibrosis, and we have watched as her lung function has deteriorated over the years, severely limiting any physical activity. Before her double lung and heart transplant, she was forced to be on supplemental oxygen and would have trouble taking walks, or climbing stairs, having to stop to catch her breath every few steps. 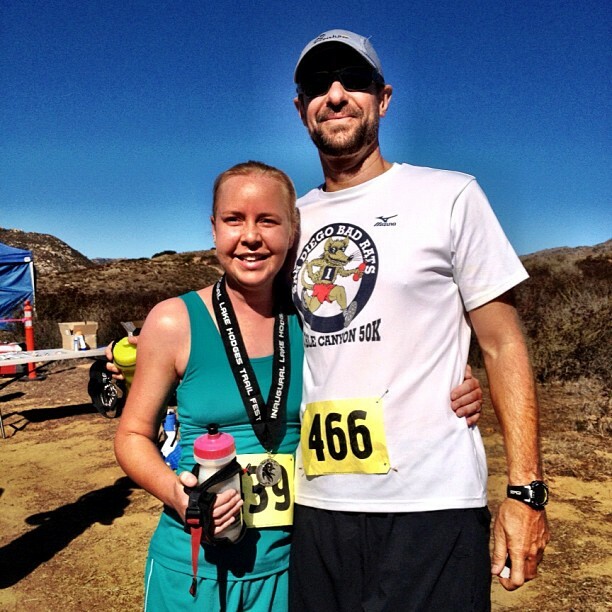 Before Sharlie went into her transplant surgery, she looked at me and said, "I'll see you on the trails." At that point, we were all just hoping that Sharlie would make it through the surgery without complications and that her frail body would accept the donor's organs. Our family had been through this before. I lost my youngest sister after her body rejected her donor's lungs in a similar surgery, so my greatest wish was that Sharlie would just make it through and that these new lungs would extend her life. I wasn't allowing myself to even dream that we would soon be running on the trails together. Sharlie's surgery and recovery went amazingly well. In the months since her surgery, she has been to Paris, rode in a 36 mile charity bike race, and when I asked her if she wanted to run the Lake Hodges Trail 5k with me, she didn't hesitate. I gladly switched my entry from the 50K to the 5K, my wife signed up for the 15K, and my daughter signed up for the 1 mile kids' run. I got to the race early to see off some friends who were running the 50K. Paul Jesse, the race director, did a great job organizing four different race distances and courses. The day was beautiful and the atmosphere surrounding this race was amazing. 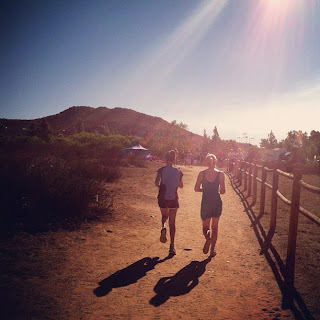 The Lake Hodges 50K was my first ultra race back in 2007, and I have spent some good miles on the trails around the lake. As the 5K started, Sharlie, Ryan, and I started at the back of the pack. We jogged over the single track trail, crossed a small bridge, passed the Chelsea King memorial, hiked up some steep switchbacks and jogged downhill toward the turnaround point. We were near the back, and it really gave me an appreciation for how hard people work at these races, no matter how short the distance, or how slow the pace, everyone shares the pain and the triumph in overcoming. Everyone, from the elite racers to the people who drop out because they can't take the suffering anymore, hurts at these races. We are lucky, we pick our struggle. We set goals, and endure the pain of training and racing. And we overcome, because the feeling of conquering doubt and pain is such a great feeling that even those people who bleed and cry as they cover miles on the trail, cursing this stupid activity, questioning why they choose to do this, even those people smile and keep coming back because that feeling at the finish is addictive. For some, their struggle is not a choice, but is thrust upon them, leaving no choice but to fight and survive, or to give in. I can't really describe how it felt to see Sharlie running, probably asking herself why she was out there, maybe feeling like she could have trained more, but overcoming so much to be there in the first place. Watching Sharlie fight to cover 3 miles on a trail seemed trivial and amazing at the same time because it was a battle of her choosing. As we neared the finish line, I could hear my wife and kids, and my nephew, Sharlie's son, cheering. We turned the corner and as they recognized us, they all came running toward us, and Sharlie raised her hands and ran with the kids to the finish line of this particular challenge. This is the image that I'll remember, Sharlie running to the finish, beautiful, and inspiring as her family cheers her on. 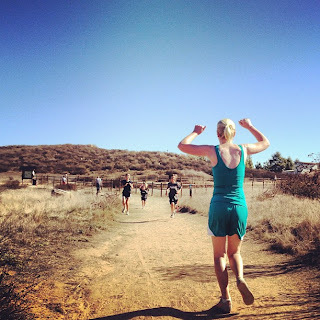 The whole day defined what I love about trail running, and racing. I was able to spend time with my family, watch my wife throw down a solid 15K, and my daughter run the mile fun run. I was able to watch and cheer on some friends who turned in some amazing 50K performances. It was great seeing everyone enjoying the trails together. Thanks to Paul and Off Road Pursuits for putting on such a great, well organized event (anyone that can corral 100 kids for a mile fun run and make sure that none of them get lost deserves major race director props). I think Sharlie has the bug now. We were just talking yesterday about how she wants to get faster and run longer, and I have no doubt she will do both. It's kind of fun to choose your own struggle. Sharlie, you have more friends than you'll ever know! We are so inspired by your life and story! My excuses are invalid. I don't know Sharlie (she's a freind of a friend) but I think of her often when I run. I'm so glad to know she is doing well and able to enjoy activities that she was unable to do mere months ago. Amazing family.